The music industry in the country suffered another blow in the early hours of last Sunday when the cruel hand of death snatched veteran musician Stanley Peiris. A product from St. Anthonys College, Katugastota, Stanley reigned the music scene for thirty three years but was cut short of a full span by a terminal illness. He was a young man interested in music from his school days. When Clarence Wijewardene started from Ratnapura in the mid 1960s to introduce the pop style in Sinhala, this fever spread like wild fire in the country. Many groups emerged to the scene but unlike today they came with their own identity. Stanley Peiris came with the "Fortunes" from Kandy specialising in instrumental music, an innovative idea in the Sinhala pop scene. This young group had something unique. They had a combination of a twin saxaphone blend in the band. These saxaphone twins were Stanley and the late Rangith Perera who died early at the age of 44.
Who gave Stanley and the "Fortunes" the big break in the music scene? Only a few people close to Stanley knows it. The man responsible is known as the "God Father" of Sinhala pop music and he is the dynamic EmCee, Vijaya Corea. Vijaya has introduced over one hundred pop musicians to the recording studios in the then Radio Ceylon. Way back in 1969, Vijaya Corea travelled to Kandy to compere at a dinner dance. The band in attendance was the "Fortunes" led by Stanley Peiris. He was moved by the unique blend of the twin saxaphone by Stanley and Rangith. This demonstration was very appealing and Vijaya urged Stanley not to hide in the hills of Kandy anymore but to call over in Colombo to give him the break. In the meantime, Vijaya got in touch with Gerald Wickremesuriya of the "Childrens Book Shop" who produced records for his "Sooriya Label". It was a time Clarence and many other groups had come out with Sinhala pop songs that hit the beams everywhere. Therefore, Gerald was reluctant to record instrumentals which was something new. Vijaya was a man able to convince the impossible. This was another rare talent in this veratile compere who reigns the scene for over four decades. Finally Gerald agreed to have Stanley and his "Fortunes" for a "test" at his Sea View Avenue home in Colpetty one morning. But, Gerald wanted Vijaya to be there to prove the talents of this young man Stanley. Well... Stanley and boys started and up went the thumb of Vijaya Corea and Gerald responded with a smile that confirmed Stanley and his boys had a future. 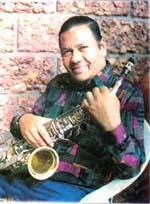 The "Fortunes" led by Stanley played the popular composition of Clarence Wijewardene for Indrani Perera "Kalu Kelle" on the twin saxaphone. Gerald was convinced that the twin saxaphone men and the group will go a long way. When Stanley met Vijaya while directing music for Upul De Almeidas son Jude two years ago where Vijaya was there to see the checks and balances, Stanley recalled with gratitude to tell Upul: "If not for this man Vijaya, I would not be directing music for your son". Stanley was a large hearted musician who shared his talent with many. He was never a "Guru" who hid the "Masters" and gave less to students. Millions in this country may have seen Stanley pumping his full energy into the saxaphone which is a difficult task. In the same way he pumped his talents into young musicians of the day. He gave up a lucrative career in the Navy as a Signal Officer to continue in music. Stanley Peiris went from record to record in his career that spanned nearly forty years. Could anyone believe that this man directed music for 700 cassettes? Yes... he did and the number of songs are over four thousand. This could be an all time record of a musician in this country. His compositions were sung by those in that era as well as in the present day. He never copied others in the direction of music. That is why musicians like Stanley Peiris and Clarence Wijewardene are unique in the pop music scene. Though they are no more, they will ever live in the music industry. Like Clarence, Stanley too made his break in the film music industry. In 1981 he did music for the film "Saranga" followed by "Soora Saradiel" and "Bycikale". Now Stanley is no more. He was a talented musician ever grateful to those who helped him when he was very sick. From his sick bed he thanked those who organised a musical show at the BMICH last month to help him in his sickness. He was confident of recovery. But, unfortunately it did not materialise. Not only his wife and children but also the saxaphone he embraced for four decades feel his loss. Millions of his fans do feel his loss. Stanley has done his duty by his country. He has given his talents to promote the music industry. The country has a duty to safeguard his creations. It is no easy task for his widow to keep track of thousands of his creations. Piracy, copy and destruction of creations of great musicians are rampant in the music scene today. Many widows of great muscians weep today as the creations of their husbands are copied, robbed and destroyed by pirates. In addition there are men who come forward to meet these widows after the death of these great men saying they were close friends of their husbands to rob the creations by organising small payments through cassette producers. Finally these pirates record the creations of these great muscians. Clarence Wijewardenes greatest fan was his wife Sheela. After Clarence died his creations were pirated in a manner explained above. During Clarences lifetime, none of his close and good friends have ever seen such pirates in the company of Clarence. Today Clarences wife is not only weeping but also insulted by these pirates who copy the voice of Clarence. No monkey musician could ever copy the talents and voices of Clarence and Stanley. Therefore, Mrs. Stanley Peiris must be careful of people who claim to be friends of Stanley after his death. Let not the fate that befell Mrs. Sheela Wijewardene and Mrs. C. T. Fernando be the same for Mrs. Stanley Peiris. Stanley, Clarence, C.T., Sunil Shantha to name a few left their intellectual property to their wives and children to earn a living and not for copy cats or monkey muscians to make a fast buck through piracy. Those responsible in the state must look after the interests of the intellectual property of these great men. That is the only honour a government can bestow on them and their families. If Stanleys creations are robbed, his well earned eternal rest would be disturbed. On behalf of these great musicians this writer urge the copy cats and monkey musicians not to disturb them in their well earned rest. Let Stanley Peiris rest in peace.